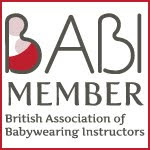 We are thrilled to offer parents a wider range of slings to try before they buy. We have now available for hire four brand new Hoppediz slings. You can learn about the quality and manufacturing of these slings on Hoppediz website. To hire a sling, contact our sling librarian who will be happy to guide you and arrange dispatch/collection. For a list of retailers that offer a discount to our customers, check our Useful Links section. Woven wrap Wien This is a German-style woven (GSW) wrap, made of twill weave cotton. It is sturdy, medium thick and can be used from birth and well into toddlerhood. From experience, this wrap will need breaking in as it is brand new. 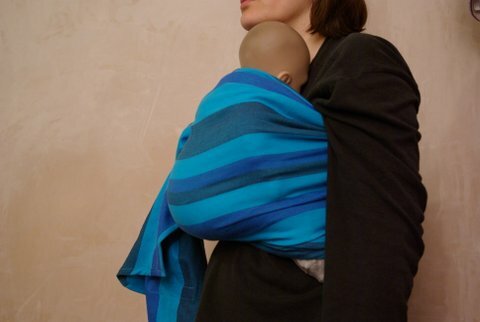 Once softened with use, it will make a great toddler wrap. Bondolino Made of the same twill weave fabric. 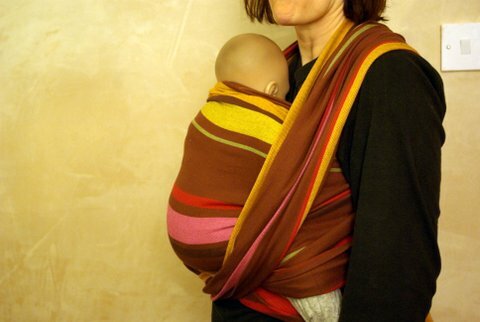 This is a hybrid between a Mei Tai and a Soft Structured Carrier. 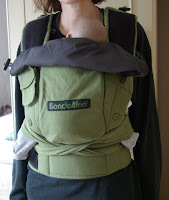 Bondolino features a velcro padded waist strap, and two padded shoulder straps to tie Mei Tai style. It has got a integral hood that can be rolled up when not in use. The Bondolino can be used on the front and on the back. It can be particularly appealing to dads with its velcro straps and sober colours. Ring Sling Dublin This ring sling is made with the same fabric as the corresponding woven wrap. It has got a spread shoulder with large colour-coordinated rings. As with the wrap, expect it to soften with use. 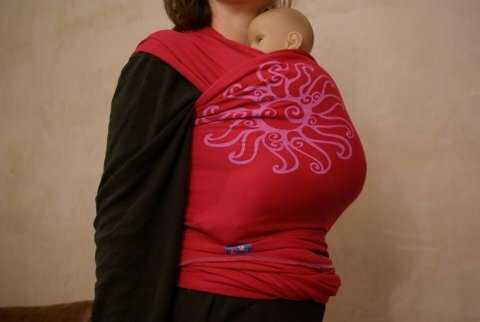 The Hoppediz ring sling makes a great hip carrier for toddlers, at the in/out stage. Stretchy Wrap Fuschia Sun Made with 100% stretchy cotton, it is very light and soft. It is ideal for newborns and the first few months. This one measures 5.40m, most suitable for very tall and large parents.